As with the sketchy origins of noodles, the story behind the invention of udon is also very much inconclusive. Rumour has it that these wheat-based white noodles were first developed by a diplomat during the 6th century, but there are also other stories that claim udon was adapted from a Chinese recipe by two different Buddhist monks in the 9th and 13th centuries respectively. Regardless of who the inventor was, one thing is for sure: udon is one of the thickest noodles used in Japanese cuisine. Interestingly, while udon is undisputably the thickest of noodles in Japanese cuisine, its shape and thickness vary from region to region. 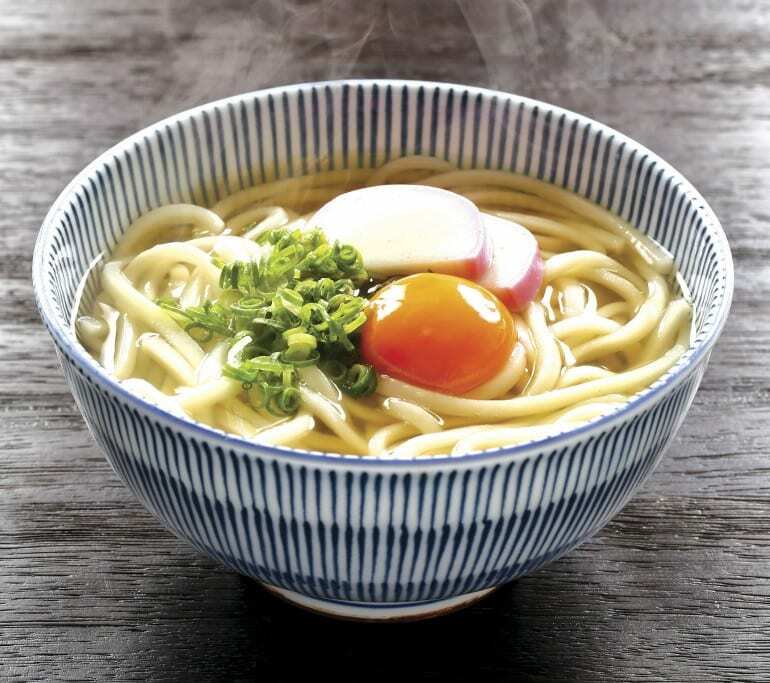 Saitama Prefecture produces the most variety of udon, such as Konosu Kawahaba udon (which has a width of 5cm!) and Niiza carrot udon (the noodles are kneaded with carrot, which lends them their vivid orange colour). But one of the more unique varieties of udon has got to be mimi udon from Sano city, Tochigi prefecture – hand-moulded to resemble the shape of a demon’s ear, eating these noodles during the New Year denotes that the demon would not be able to hear a word you say, hence warding you off sickness and other problems for the coming year. Another characteristic of udon is its consistently chewy texture, which is the result of continual kneading and stretching during the udon-making process. Comprising two key ingredients — wheat flour and lightly salted water — udon boasts a neutral flavour, rendering it ideal with stronger flavoured dishes. How udon is served also differs from region to region. Generally, these substantial noodles can be eaten chilled with a dipping sauce or as part of a salad, as well as hot as part of a soup or stir-fried dish. In eastern Japan, udon is typically served with dark brown broth made from dark soy sauce, while in western Japan, it is served with light brown broth made from light soy sauce. Common toppings include thinly chopped scallions, tempura, and kamaboko (fish cake shaped like a half moon).